We love a decorated home. Any holiday, any occasion, any reason. 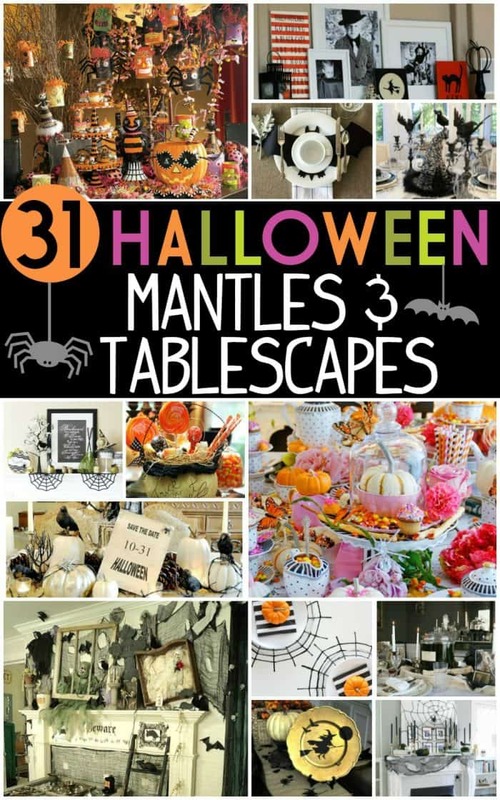 These Mantles and Tables are inspiring for the Halloween season. 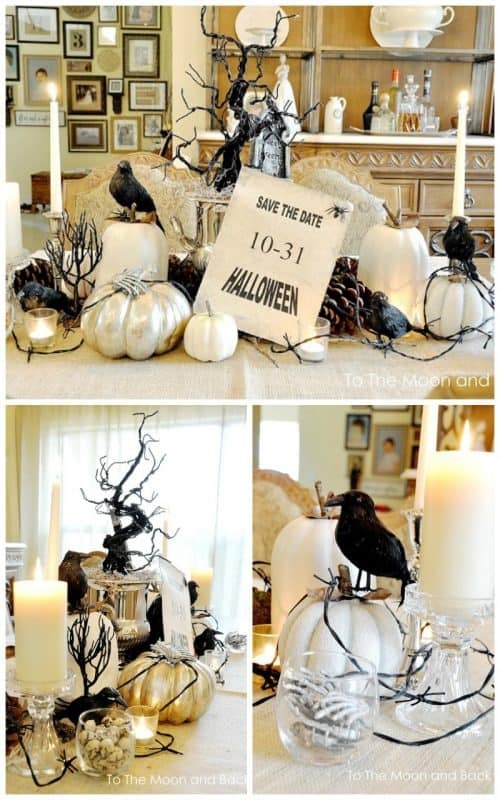 Take a look at these spooky ideas, eerie scenes, and kid-inspired home ideas. There is something for all! This Mantle of Curiosities has me shaking in my boots from Blackberry House. Using the vinyl on their mantle is creative, also like the recycled ladder with rats. 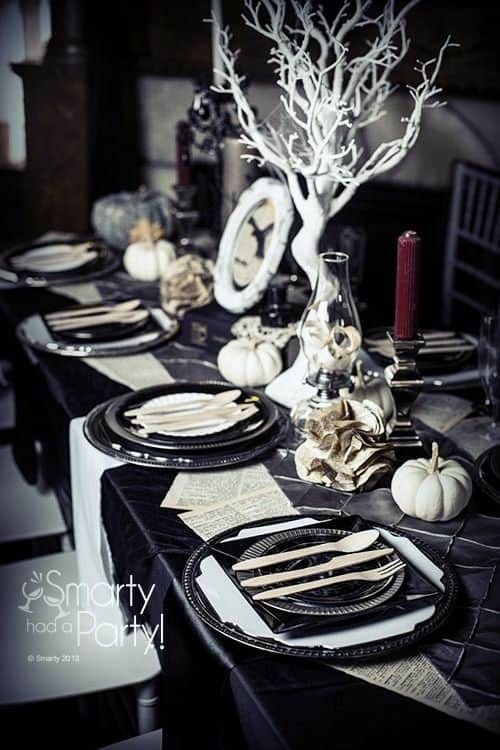 There is no denying the time and attention detail placed in this Mad Scientist Halloween Tablescape from The Happy Heather. 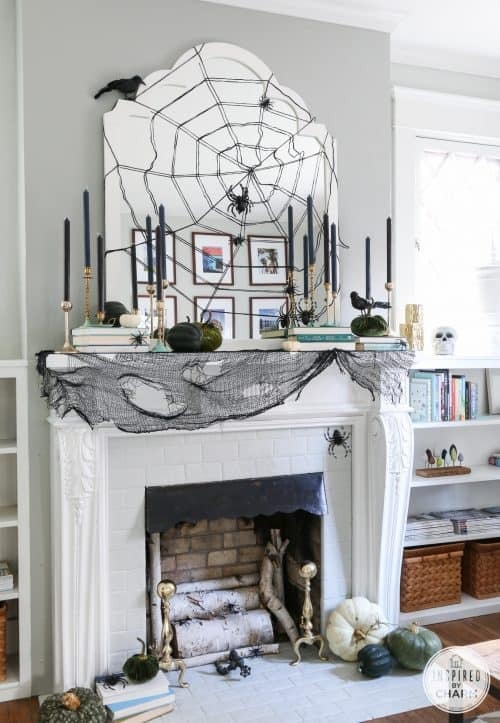 Bringing a mirror with a web and some simple black candles creates this Stylish Halloween Mantle from Inspired by Charm. 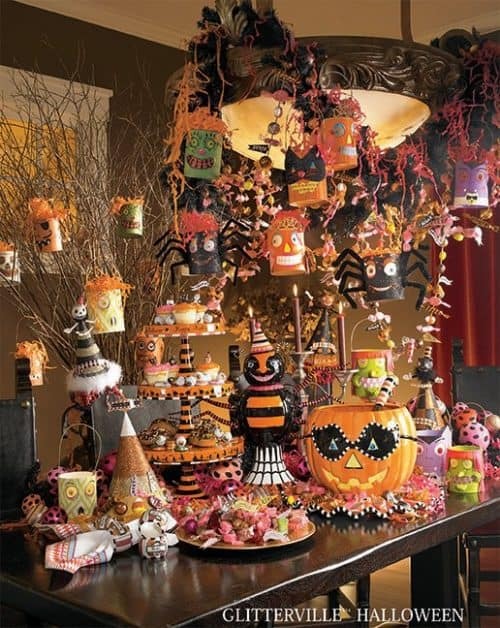 I thought for a second I was in a Pottery Barn Magazine for this Halloween Kid’s Table from Loralee Lewis. Such fun details and creativity! 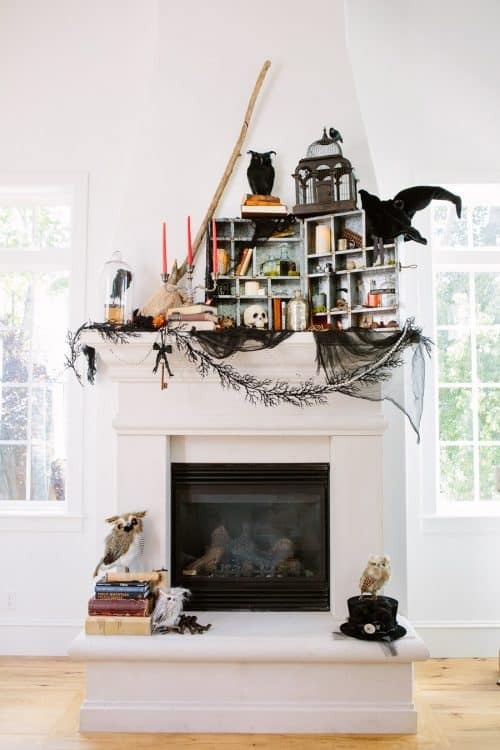 I love the innocence of this Spooktacular Mantle from Pocket of Posies. It isn’t too scary and still matches her white living room. I get adding some battery operated candles at night would add some thrills. 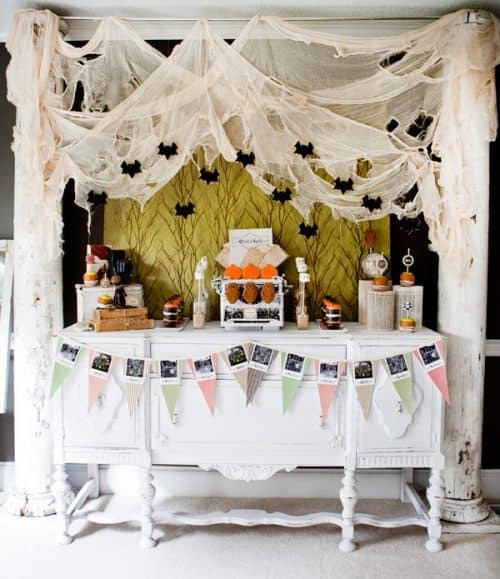 Tom Kat Studio has an amazing Halloween Glam Table with touches of green, black, and purple. You know, it doesn’t have to be too busy. 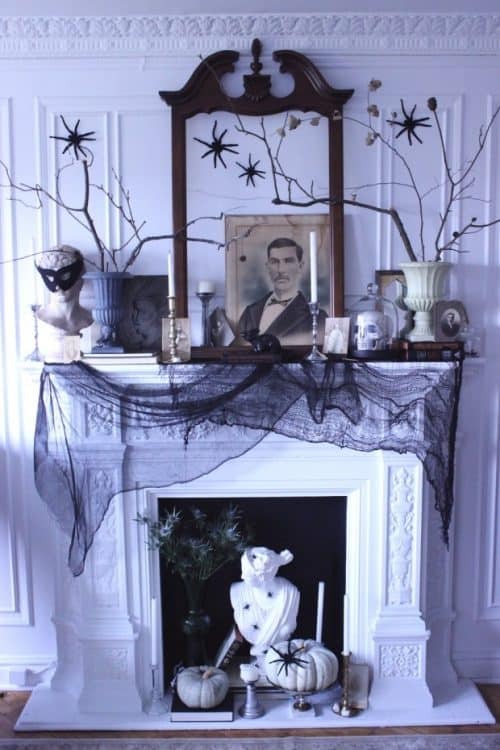 Simplicity well thought out also makes a large statement like this Vintage Halloween Mantle from Lolly Jane. 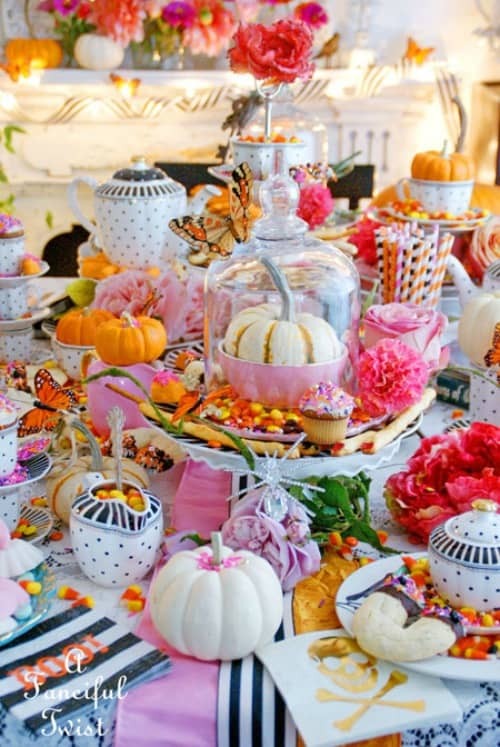 Who would not love this Silly Halloween Tablescape from Glitterville Halloween. I love how everything has eyes! 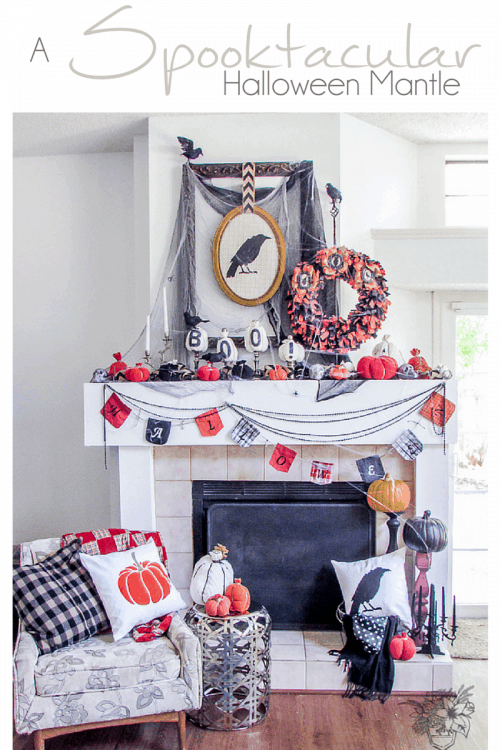 Mix and Match both a Halloween and Autumn Mantle with fall leaves and gourds and spiders and crows from Sweet Something Design. 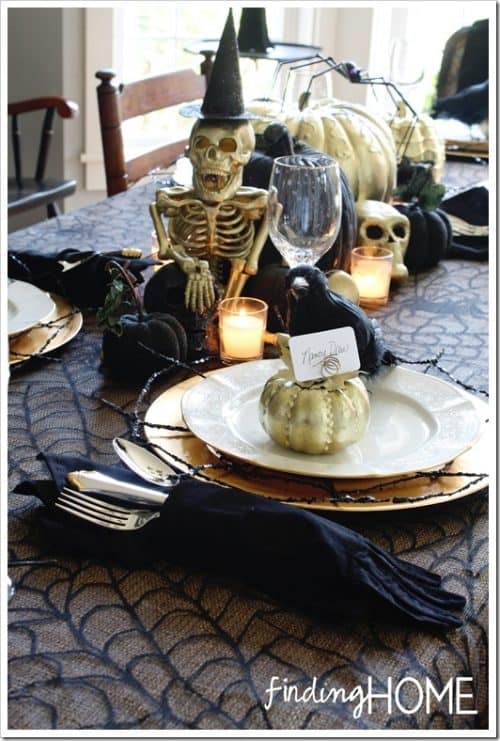 Finding Home Farms has an Elegant Spooky Tablescape. I love the crows on the plates. Looking to buy some beautiful Halloween Decorations. Grandinroad has some amazing pieces. 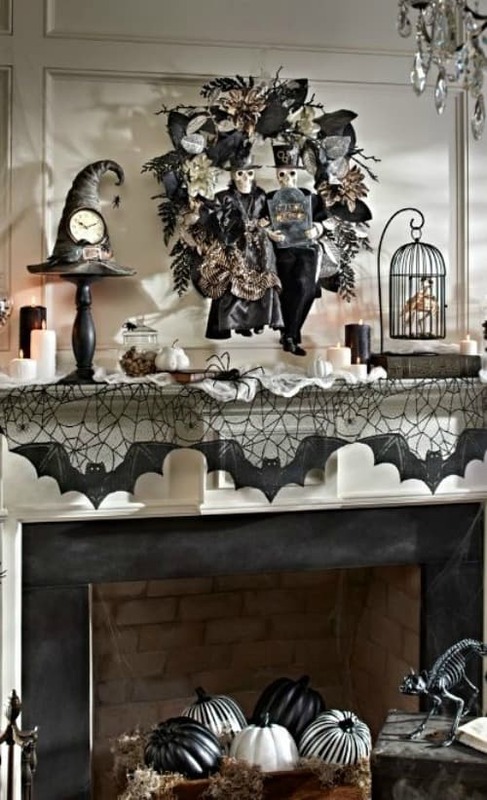 I love this mantle with pumpkins in the fireplace and a spiderwebbed bat runner. These Spider Web Placemats are such much easier than you think. 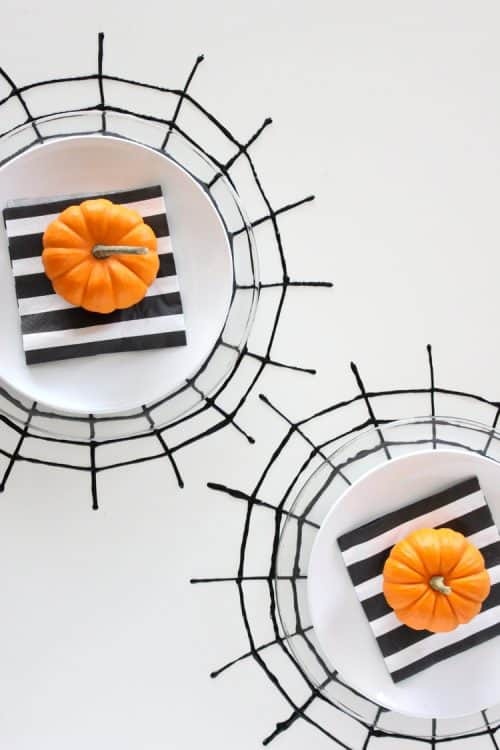 I love the way Delia Creates used a simple napkin, pumpkin and allowed this DIY Spider Web Craft to stand out! 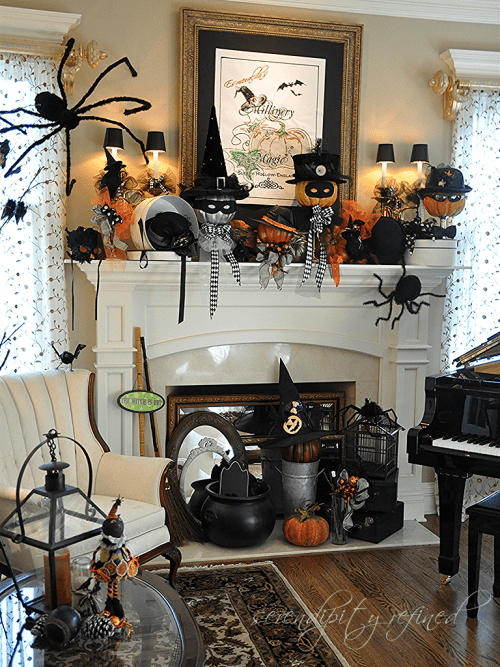 Take a look at this Eclectic Halloween Mantle from Serendipity Redefined. I love the crow with the witch hat! 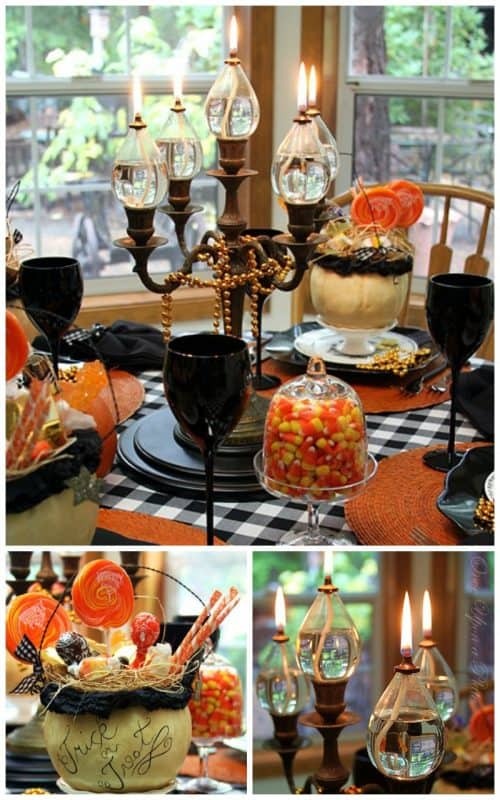 Hostess with the Mostess has a Vintage Style Halloween Buffet for her friendly kid-themed party. 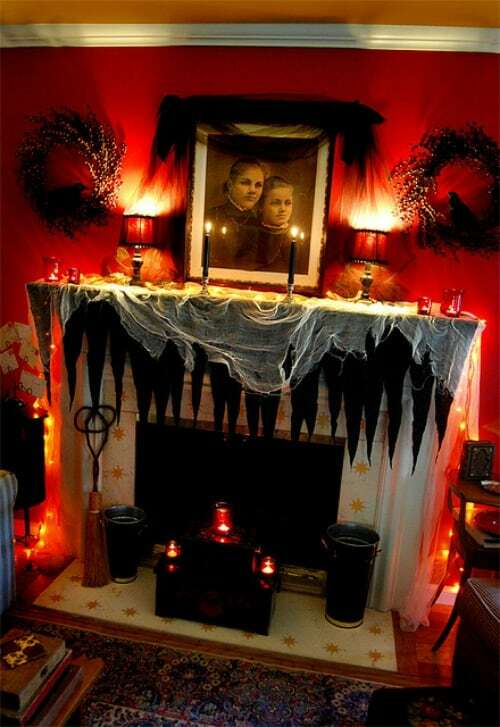 Are you seeing red in this Halloween Mantle – so creepy. Idea on Homedit. 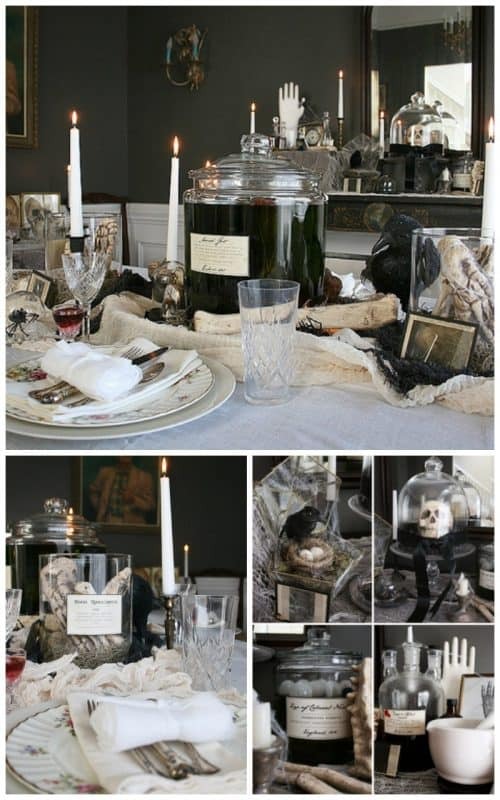 Your Halloween Tablescape doesn’t have to be eclectic. 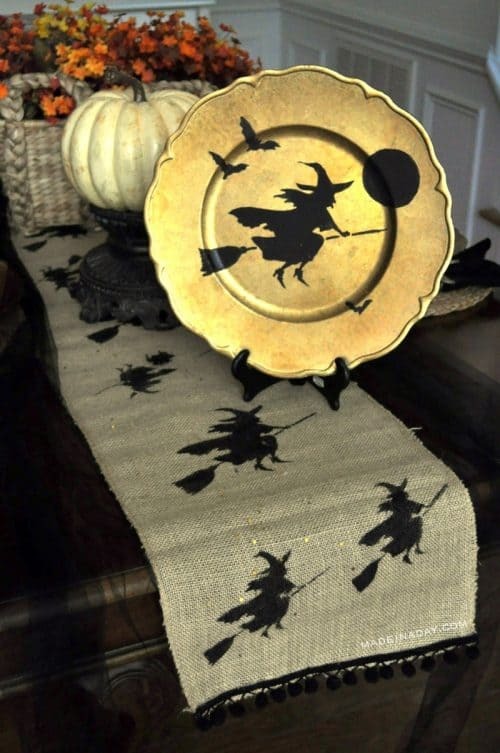 Try someting like this Witch Plate Charger and Table Runner Tutorial from Made in a a Day. 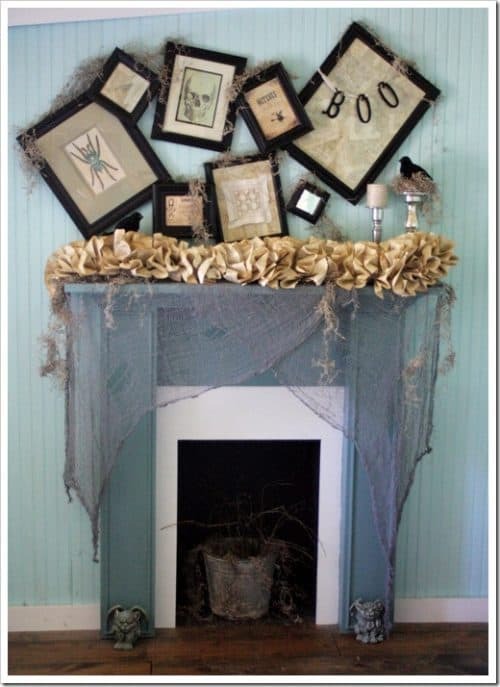 How creative is this Dollar Store Halloween Mantle from The Shabby Creek Cottage, the crooked frames are so unique! To the Moon and Back has a creative Burlap Tablecloth Halloween Tablescape – Make sure to save the date for October 31st! 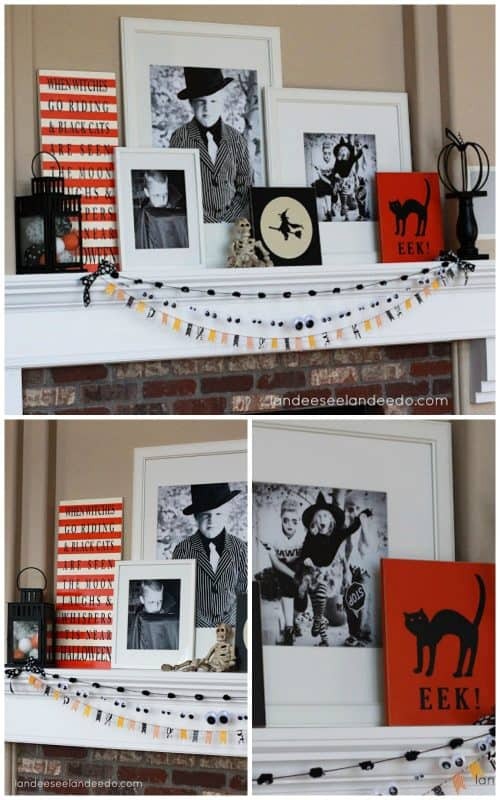 Landeelu used her own family to come up with this creative Halloween Mantles with Photos – I think the kids would love that! 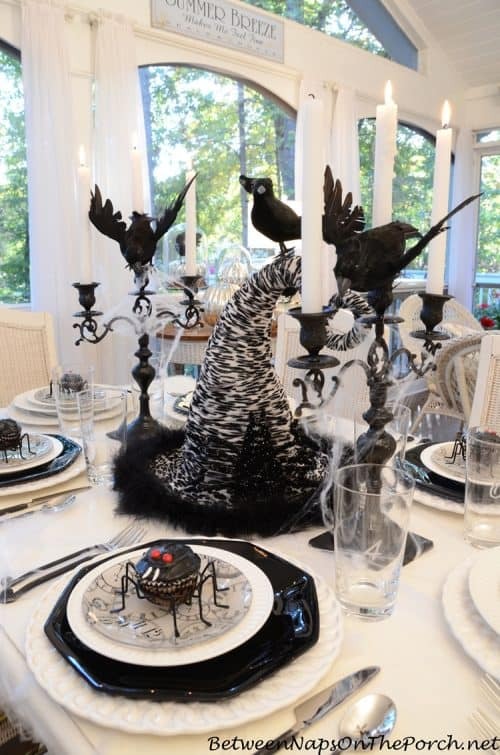 Whimsical is the best way to describe this Witches Garden Halloween Party from A Fanciful Twist. 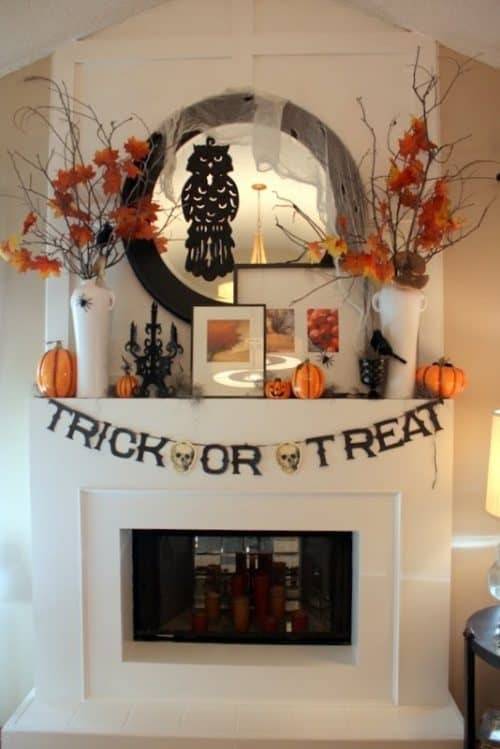 How about this Halloween Mantle with Profiles – I just love the dog! Source Unknown. 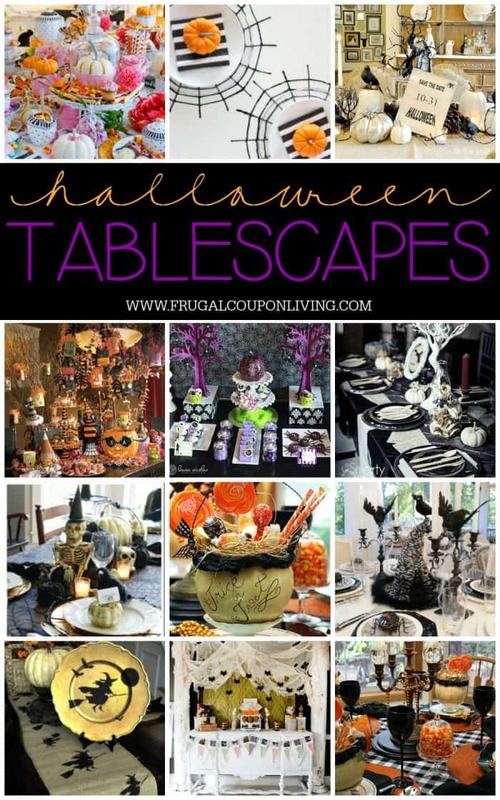 Once Upon a Plate has a Witch’s Cauldron Gift at each of her place settings on this Halloween Greetings Tablescape. 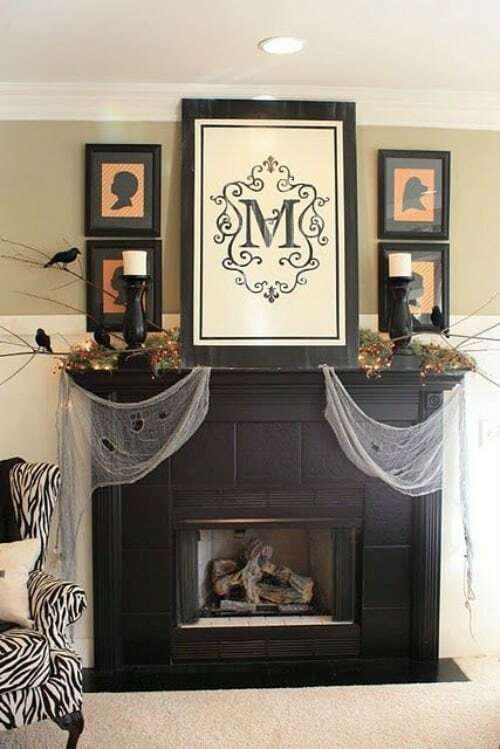 This Chalkboard Halloween Mantle is fun, I love the reclining skeleton. 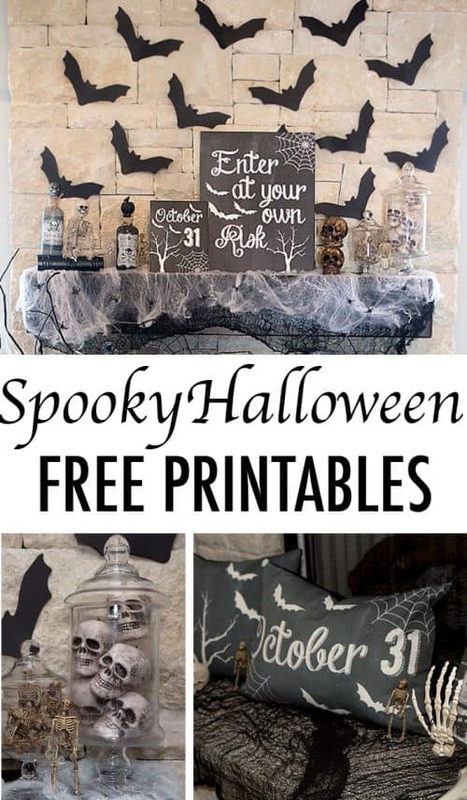 It also comes free Halloween Printables including a Boo Banner and Chalk Prints from Lillian Hope Designs. Smarty Had a Party has a fun idea using Recycled Newspaper to create a Halloween Tablescape with DIY Newspaper Pomanders. 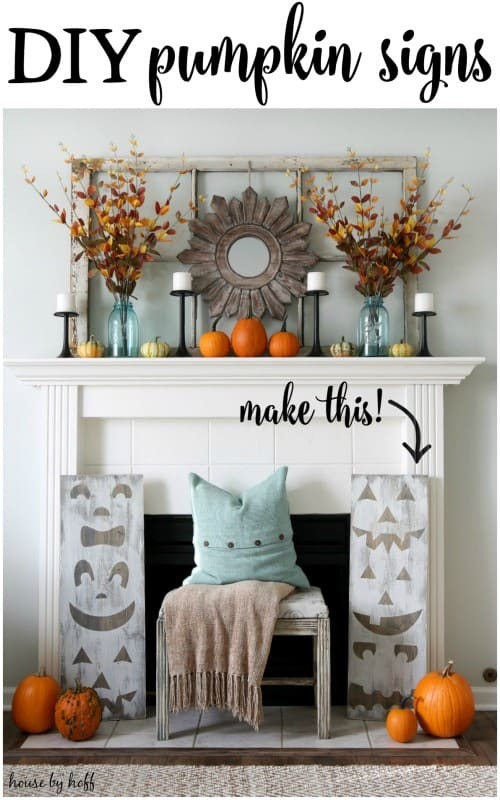 House by Hoff has a Simple Halloween Mantle with a tutorial on DIY Jack-o-Lantern Signs. 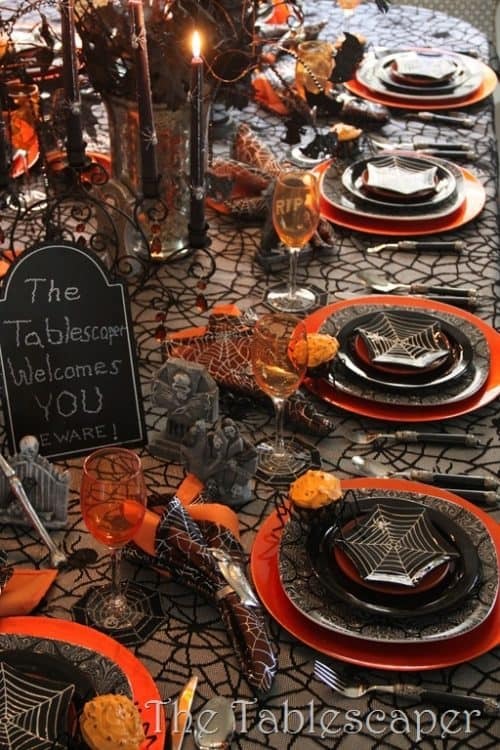 Beware of this Spiderweb Halloween Tablescape from the Tablescaper. How eerie is the glow on this White Halloween Mantle on Cure Design Group. We love the dead twigs they brought in from the yard. 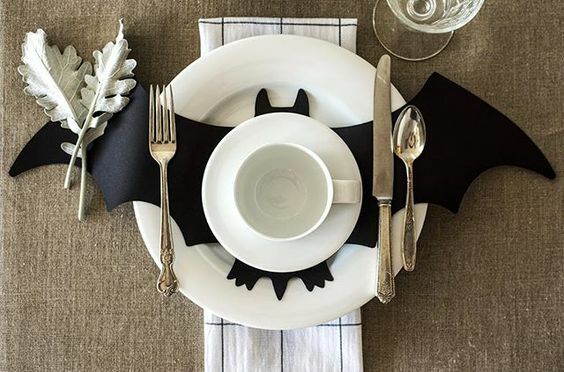 Use black construction paper or chalkboard paper for this Halloween Bat Centerpiece. Idea on Hester and Cook Instagram Page. 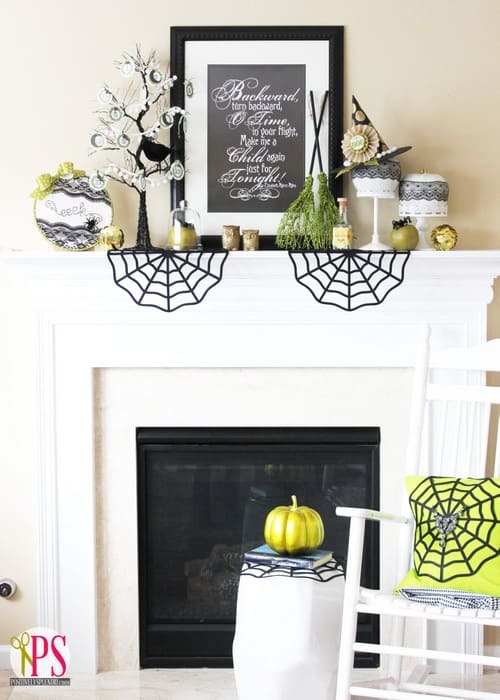 This Touch of Green Halloween Mantle from Positively Splendid is easy, simple, and not scary! 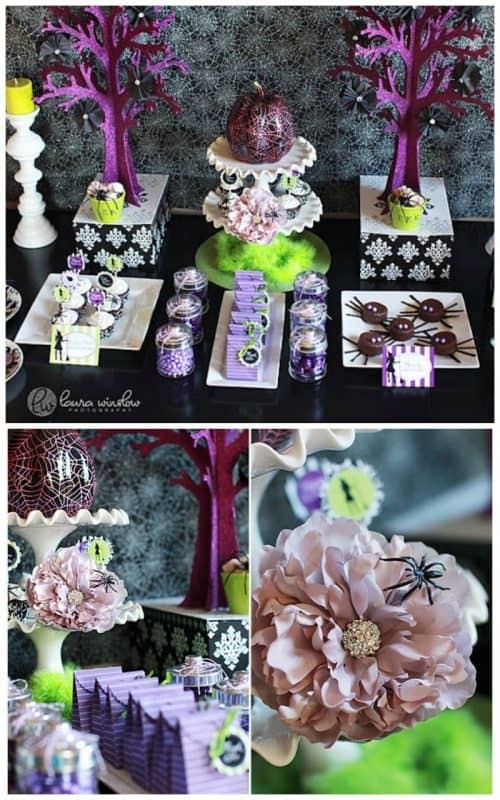 Take a look at this Crow Halloween Tablescape with Spider Cupcakes from Between Naps on the Front Porch. 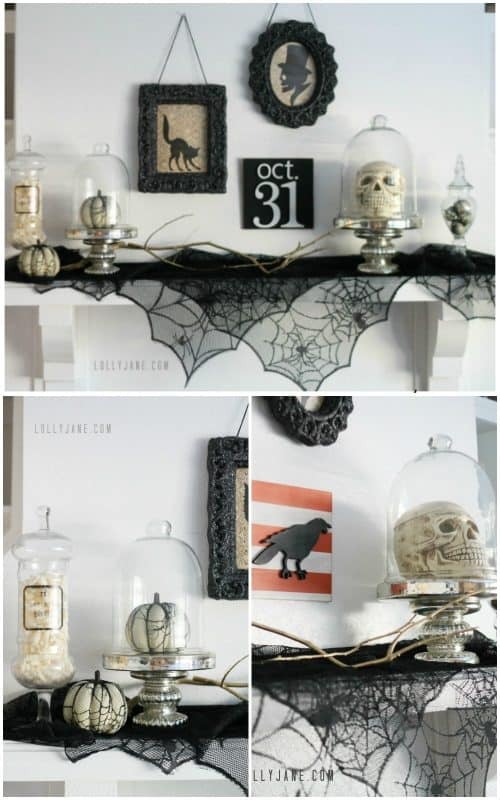 Still need help with your Halloween Mantle? 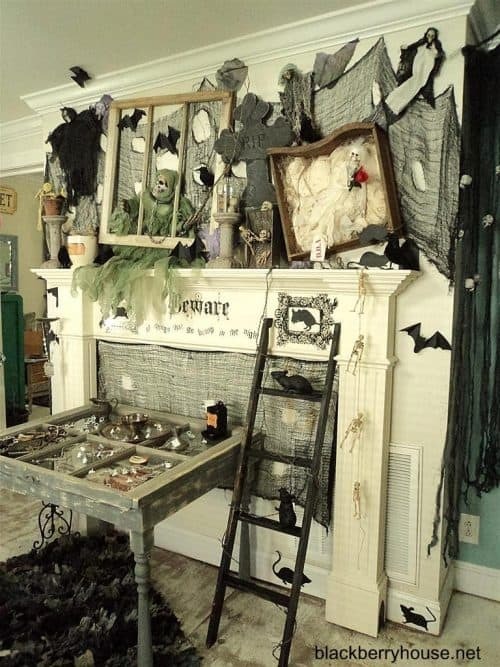 Take a look at this Step-by-Step Halloween Mantle Guide on Handmade Mood. If you are going out for a night on the town collecting candy, you have to have the cutest backdrop for your Halloween photos. 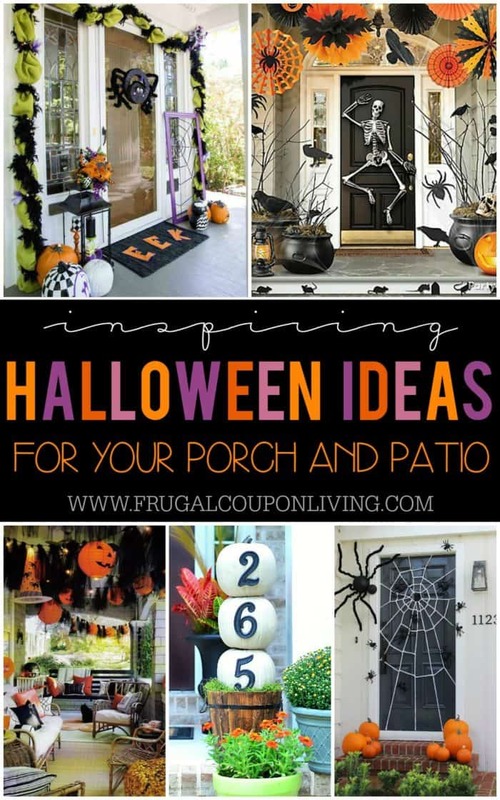 Take a look at these Boo-tiful Porch Halloween Ideas and Patio Inspiration. Pin to Pinterest. 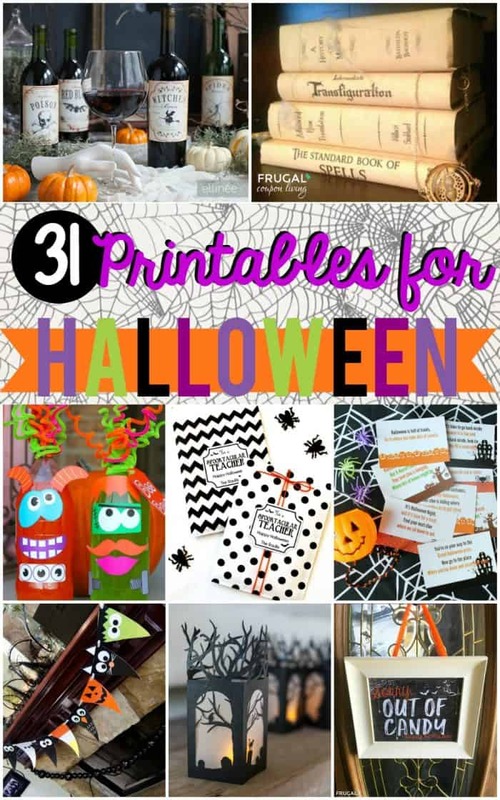 Take a look at our 31 FREE Halloween Printables. Pin to Pinterest.